As long as the Beat Generation continues to engage self-styled hipsters, counter-culturalists, and transgressors, the work of the late Burroughs (1914–97) will continue to waste precious wood pulp. Admired for what we now know to be something of a group effort—Naked Lunch—Burroughs never repeated its critical success, though extraliterary scandal (and constant marketing by Allen Ginsberg) helped keep him in the public eye. 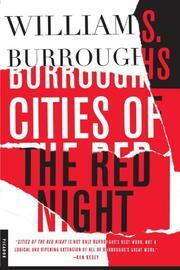 First published in 1981, Cities of the Red Night was no exception: Kirkus pronounced it DOA. Meandering and full of “neo-Reichian crackpottery,” we dismissed it as “ponderous, self-anesthetized,” and dealing in “pursy anarcho-pietisms and tennis-shoe philosophy.” Worst of all, it’s “not at all funny”—“a sad come-down” for a writer who once seemed to have an almost vaudevillian sense of shtick and surprise. What’s left, then and now? Kirkus’s view still holds: “a dry schist of pornographic semi-moralism so flavorlessly numbing that we can’t really imagine it offending” anyone, puritans or plain-old readers.